A false-color X-ray image from space. The dim green disk is the Sun. The bright white spot is the solar flare. The Sun kicked up one of the largest flares on record Wednesday and more eruptions are likely in coming days, forecasters said. Communications and satellite operations could be affected over the next two weeks. The flare was rated an X-17. All X-flares are major, and few have been recorded that were larger than X-10. It erupted from a sunspot that was on the limb of the Sun, so while X-rays and other radiation reached Earth in minutes, the bulk of the matter blown out from the site was not directed our way. "This flare, the fourth largest in the last 15 years, erupted just as the Region 808 sunspot cluster was rotating onto the visible disk of the Sun," said Larry Combs, solar forecaster at the NOAA Space Environment Center. It still had a significant impact. "This event created a complete blackout of high frequency communications on the daylit side of Earth, which included the entire U.S. and basically anywhere the sun was shinning at this time," Combs said. "Communications used by emergency services along the Gulf Coast may have experienced problems due to this flare. Low frequency navigation systems may also have experienced a period of significant degradation." The flare was observed at 1:40 p.m. ET Wednesday. Major flares are typically accompanied by coronal mass ejections, which take from several hours up to a couple days to arrive. These ejections of charged particles race outward in an expanding bubble. When they interact with Earth's magnetic field, they can disable satellites, generate colorful lights called auroras, and even trip power grids on Earth. Because Wednesday's eruption was pointed away from Earth, the expanding bubble was not expected to produce more than a glancing blow to the planet. But as the sunspot rotates onto the face of the Sun, further eruptions could have significant impact, forecasters said. Sunspots are regions of pent-up magnetic energy. They are darker and cooler than the rest of the solar surface. 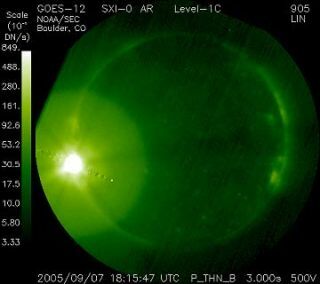 The largest flare in modern times was recorded in November 2003 and was estimated to be an X-40. It, too, was on the limb of the Sun and so its full impact was not felt on Earth.